(BOB GREENE) By the end of the Super Bowl on Sunday night, one or more professional football players will be hailed for their valor, for their guts, for their devotion to their teammates. They will be called heroes. And more than 100 million people will be watching. But because, predictably, those laudatory words will be thrown around so casually on Sunday, perhaps we can take a few minutes here to address an act of genuine valor that happened exactly 70 years ago today. It wasn’t televised. There were no sponsors. 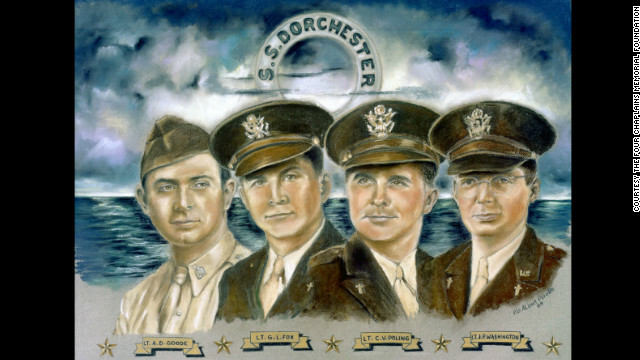 On February 3, 1943, an Army transport ship called the Dorchester, carrying American soldiers through the icy North Atlantic on their way to serve in World War II, was about 100 miles off the coast of Greenland in rough sea. More than 900 people were on board. Many of them were little more than boys — young soldiers and sailors who had never been so far from home. The journey had been arduous already, with the men crammed into claustrophobic, all-but-airless sleeping quarters below deck, constantly ill from the violent lurching of the ship. In the blackness of night, a German submarine fired torpedoes at the Dorchester. One of the torpedoes hit the middle of the ship. There was pandemonium on board. The Dorchester swiftly began to sink. The soldiers and sailors, many of them wakened from sleep by the attack, searched desperately in the dark for life jackets and lifeboats and a route to safety. With them on the ship were four military chaplains, from four disparate religions. They were Father John Washington, born in Newark, New Jersey, who was Catholic; the Rev. Clark Poling, born in Columbus, Ohio, who was ordained in the Reformed Church in America; Rabbi Alexander Goode, born in Brooklyn, New York, who was Jewish; and the Rev. George Fox, born in Lewistown, Pennsylvania, who was Methodist. In the chaos onboard, according to multiple accounts by survivors of the attack, the four men tried to calm the soldiers and sailors and lead them to evacuation points. The chaplains were doing what chaplains do: providing comfort and guidance and hope. With the Dorchester rapidly taking on water, there were not enough life jackets readily available for every man on the ship. So, when the life jackets ran out, the four chaplains removed their own, and handed them to soldiers who didn’t have them. Rabbi Goode said that Mahoney should not waste fleeting time, and offered Mahoney his own gloves. When Mahoney said he couldn’t deprive Rabbi Goode of his gloves, the rabbi said it was all right, he had two pairs. The story of the four chaplains was quite well known in America for a while; in 1948 a first-class 3-cent postage stamp was issued bearing their likenesses. There are still stained glass windows in some chapels across the U.S. that pay tribute to the four men, including at the Pentagon. But the national memory is short, and they are no longer much discussed. February 3 was, years ago, designated by Congress to be set aside annually as Four Chaplains Day, but it is not widely commemorated. This Super Bowl Sunday, with its football heroes whose televised exploits are bracketed by commercials for beer and corn chips, will be no exception. The nation’s attention, this February 3, will be focused on the game. But perhaps, at some point in the day, we can pause for a moment to reflect upon what valor and courage and sacrifice really mean. How rare they truly are.